Despite D.C. legalizing cannabis for medical use in 1998, the first medical dispensary in the nation’s capital did not open until July of 2013. D.C. permits medical patient reciprocity, which allows certified patients from other medical states to purchase from any of the city’s medical dispensaries. D.C. now gives patients in Maryland an alternative from which to purchase their cannabis; this creates a strong competitive environment for the dispensaries close to the D.C. border. 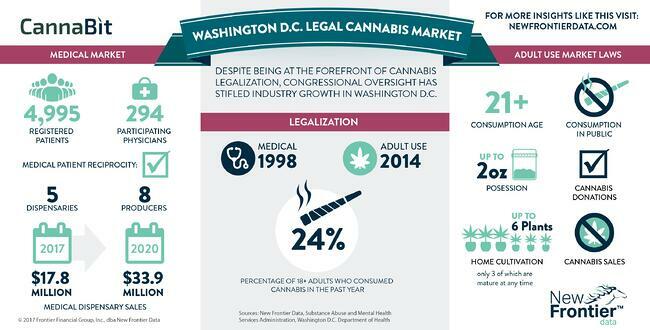 The city legalized adult-use in 2014, but Congressional intervention prevents legal retail sales. Many businesses now charge high prices for unrelated products, like baked goods, juices, or art, and “gift” cannabis with the product. Adults 21 years of age or older can possess up to two ounces of cannabis and may cultivate up to six plants at home (with three or fewer mature plants at any one time). Home cultivation has surged, fostered by activists who have given away seeds to hundreds of city residents over the past two years.